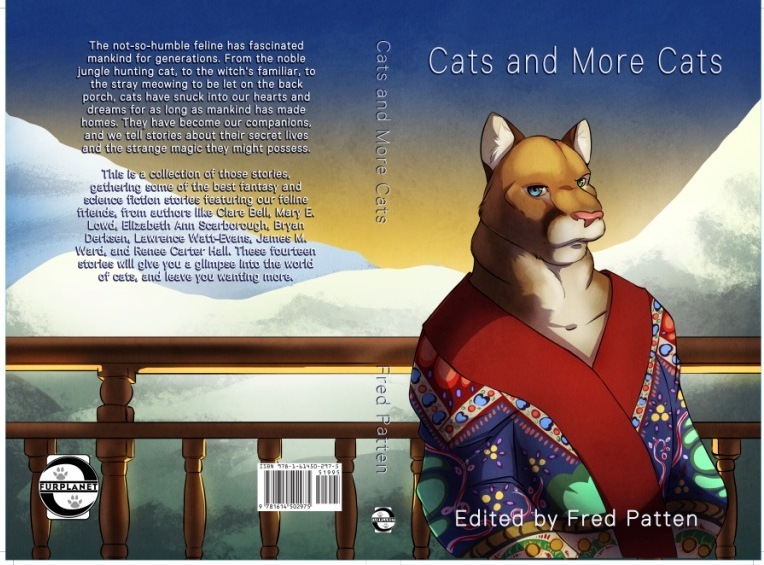 Fred Patten’s new anthology Cats and More Cats; Feline Fantasy Fiction is launching at Further Confusion 2016 in San Jose over the January 14-18 weekend. Cats and More Cats is a reprint anthology containing 14 short stories and novelettes of feline fantasy fiction (“the best of the best”) from 1989 to the present, plus a new essay, and an extensive bibliography of cat fantasy books. Price: $19.95. 261 pages. Wraparound cover by Donryu. The book can be pre-ordered online from FurPlanet Productions, or purchased from the publisher’s online store after the con. This entry was posted in Like Show Business and tagged anthropomorphics, Fred Patten by Mike Glyer. Bookmark the permalink. One book we can be fairly sure won’t end up on a puppy slate . . .
Love the cover. Stories sound good. I’ll have to look into picking up a copy after the con.